TORONTO -- The New York Rangers were glad to finally get another win. The Rangers lost the last five times -- and 10 of the last 11 -- when the game went beyond regulation. The Maple Leafs gave up the opening goal for the seventh straight game (2-4-1). ... Georgiev has now stopped 130 of 136 shots in three career appearances against Toronto. ... Georgiev started for the 11th time in the Rangers' last 22 games. Four of his last six starts have gone beyond regulation. ... Toronto C Frederik Gauthier, returning after a two-game absence due to a foot injury, appeared in his 100th career NHL game. ... The Rangers were missing F Chris Kreider, F Jesper Fast, F Connor Brickley, F Fredrik Claesson and D Libor Hajek. ... The Maple Leafs were without D Jake Gardiner and D Travis Dermott. 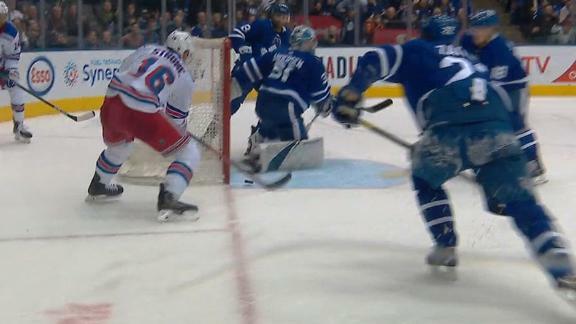 Boo Nieves' initial shot is saved, but the Rangers stick with it and Ryan Strome knocks it in off the goalie in New York's 2-1 win over Toronto.